The Witness Tree, a hundred year old red oak, at the Harvard Forest. Photo courtesy of Lynda Mapes. Trees are up to more than we think. Belying their image as mute, unmoving, and solitary, trees are not just standing there. They move. Breathe. Communicate. Politically astute and nimbly networked, trees command a sophisticated array of processes and living beings, above ground and below. Every schoolchild learns that trees use their leaves to feed themselves through an alchemy of sunlight, water, and air. While they are at it, they help make the oxygen that sustains much of life on Earth, including us. But below ground they are also hard at work. Their roots host miles of fungal threads less than 1/20th of the width of a human hair. This web of life links tree to tree and root to root, in a collaborative interspecies exchange of water and nutrients that boosts mutual survival. 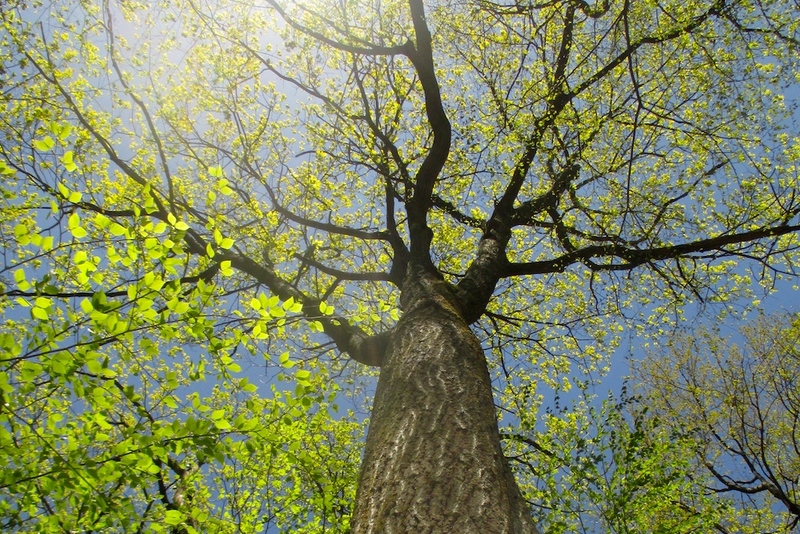 An oak can drop acorns that feed more than 100 species, from voles to black bear, mice, chipmunks, and birds. In years with big acorn crops, the effects on wildlife are far-ranging: Deer have more twins, while mice and black bear enjoy a population boom. Despite this feeding frenzy, the oak reproduces itself, with one in 500 acorns growing into a year-old seedling. I learned this—and much more—from one tree. For one marvelous year, I lived and worked alongside scientists studying the Harvard Forest, 4,000 acres of scrappy woodland in Petersham, MA, that has been cut and regrown at least three times. There I got to know a single, 100-year old red oak, which taught me the story of the natural world’s delicate seasonal timing and how it is being disrupted. This big oak stood out, soaring some 85 feet in the air and with a grand crown about 65 feet across. The dominant tree in its grove, its trunk had a spiral twist that swung it up and away from the stone boundary wall where it had stretched towards the sun when it was just a wild sprout. 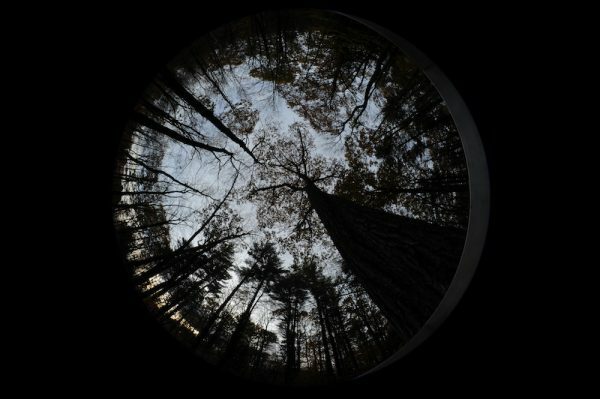 The big tree and its grove seen through a fisheye lens. Photo courtesy of Liza Nicoll. I chose my tree on the advice of John O’Keefe, a biologist at the forest, who for more than 25 years has walked a circuit of the same 50 trees. In weekly walks in spring and fall, he watches for when the first leaves emerge, when the first tints of autumn color the leaves, and when, at last, the leaves drop, and the trees go dormant for the year. And so we went out on one of his walks, auditioning trees. The first was a lovely striped maple, one of my favorites for its tresses of seed pods and leaves that turned a soft lemon yellow in fall. On twilight walks in the woods its lantern glow helped me find my way home. But it was too small—I wanted something big, soaring, with gravitas and age. The next, the oldest and largest in the Harvard Forest, was venerable all right, at about 350 years. But its species—black gum—seemed too obscure. I wanted a tree everyone would know and love. Oak is the most common species in the northern hemisphere; if it were an animal, it would be a dog. And as the dominant species in the Harvard Forest, there was plenty of research to mine, including John’s seasonal survey. We cored it to check its age and learned it had sprouted just about when the Model T first started rattling off the assembly line. That clinched it. Just as settlers once used trees to mark the metes and bounds of changing landscapes, this oak would be my Witness Tree: a sentinel and narrator to a century of environmental change. Over the six-state area of New England, forests and trees just like this one have returned in places where people stopped farming to work in factories and cities. Starting around 1750, the Industrial Revolution—stoked by burning fossil fuels—transformed not only the landscape, but also the atmosphere. Burning carbon that was stored in coal and oil and other fossil fuels over millions of years released far more carbon dioxide to the atmosphere than the Earth’s natural cycling processes, such as photosynthesis, can remove. You can see this in my Witness Tree. As temperatures rise with the end of winter, my oak awakens and draws its first vernal breaths. It’s a seasonal shift measurable at the global scale, as forests across the Northern Hemisphere break winter dormancy, and begin devouring carbon dioxide. But trees can’t keep up with our carbon. We are pumping so much into the air that not only have average temperatures increased, we’ve even changed the seasonal calendar. John’s records show that leaf-out is coming earlier, with spring advancing by nearly five days on average since he started making observations in 1989. The onset of the first frost in the fall has changed even more dramatically. Hard frost used to appear as early as the first weeks of September. By the time we began taking our survey walks together the first frosts often weren’t coming until late October. Winter is being squeezed on both ends. Because winter’s resting season is shorter than ever, my oak’s growing season starts earlier and lasts even longer than its leaves do. There is a mismatch between the seasonal timing trees inherited from their ancestors and today’s super-sized growing seasons. Everything in the woods reflected these changes: from the level of water in the vernal pools and springs, to when the leaves budded, when the blackflies were biting, when the leaves fell off the trees, and when the ground froze. And each tiny change to these seasonal milestones set off a cascade of other changes. The forces of climate change are visible even deep inside the photosynthetic cycle and physiological function of my tree’s individual leaves. Because of the longer growing seasons, my big oak is bench pressing carbon, absorbing more carbon dioxide from the atmosphere than at any time in the past 25 years. It does this by opening the breathing pores of its leaves less—therefore losing less water—because there is now so much more carbon dioxide in the atmosphere. And these are not the only changes. Left to their own devices, trees are adroit at self-defense. When it’s under attack by voracious spring caterpillars trying to eat its tender spring leaves, the big oak can defend itself by exuding a puff of pheromones to summon an air force of predatory wasps that devour the caterpillars. Eavesdropping neighbors gear up with a surge of chemicals to make their own leaves less palatable. The changes wrought by humans are having different impacts on different trees, in forests around the world. But these systems of defense, which evolved over long periods of time, don’t work when the predators are invaders. Warmer winters in New England are aiding the spread of an invasive pest, an aphid-like insect called the hemlock woolly adelgid that was introduced from its native Japan probably through infested hemlock trees. Once slowed by killing cold that kept their population in check, milder winters have allowed the adelgid to continue to expand its range on hemlock trees all over New England. Evergreens, hemlocks once spread their feathery deep green grace throughout New England’s forests, but the adelgid—against which the hemlock has no defense—is changing that. Within 50 years Eastern hemlock are expected to be all but gone in the New England woods. The changes wrought by humans are having different impacts on different trees, in forests around the world. For now, my oak thrives. How I loved it in a good soaking storm, the rain pouring off the twist of its trunk. The moss on its bark would swell to emerald, sodden cushions I could sink my finger in to the knuckle. The fragrance of its leaves, layered and thick on the ground in fall, will never leave me: mushroomy, earthy, the scent of life itself. I lie under my tree and think over the 100 years of its life, all it has seen. I think of its genius, abiding with other species above and below ground. Lynda V. Mapes is the environment reporter at The Seattle Times and author of Witness Tree: Seasons of Change in a Century Old Oak, based on her work while a Knight Fellow in Science Journalism at MIT in 2013-14 and a Bullard Fellow in Forest Research at the Harvard Forest 2014-15.